Shelley Gifford liked to braid—but two years ago, through social media, she stumbled on a whole new world of creativity. 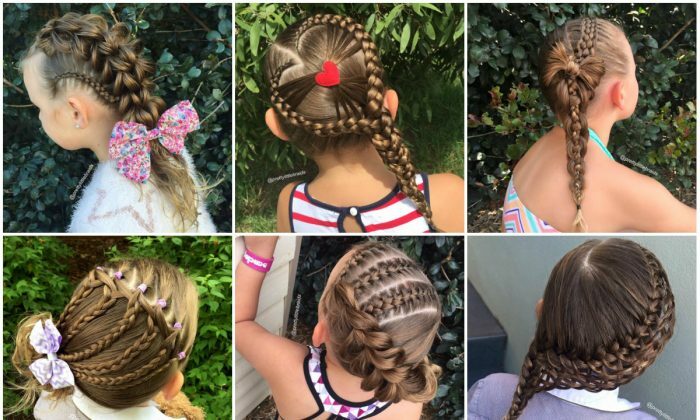 In 2014, she found accounts where moms had posted pictures of hairstyles created for their daughters. Having a little girl herself, she decided to follow suit. Growing up I always loved braiding, I would take any opportunity to braid family and friends hair. “Growing up I always loved braiding, I would take any opportunity to braid family and friends hair,” she told Epoch Times over email. However, this was basically her only experience in hair styling. “Back then, I only ever knew how to French and Dutch braid, I wasn’t aware that so many other braids existed,” she said. And so she learned—a lot. “I started following other hair and braiding accounts: asking questions and continuously watching video tutorials. I also attended braiding and up-do workshops, anything to advance my skills,” she said. Soon enough the results began to show. Her daughter, Grace, 6, has been modeling her creations, sporting a new hairstyle almost every day. Gifford says braiding is the easy part. After two years she has almost 800 hair styles under her belt. But that’s actually where the difficulty lies. Also, during the week she only has about 15-20 minutes in the morning to make her idea reality. Still, she doesn’t seem to lack in enthusiasm. Gifford already holds braiding clinics for other moms, and this year she plans to launch online tutorials. Not to mention Grace’s hair gets some attention at school and the “feedback is fantastic,” Gifford said.